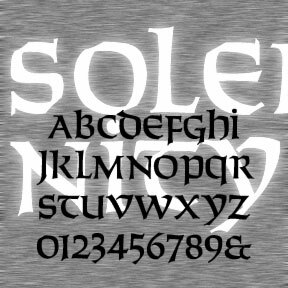 SOLEMNITY is my digital interpretation of SOLEMNIS, an analog font by Günter Gerhard Lange, 1952. I was unable to find a digital version of this distinctive font, and was eager to work with it. So I drew this one afresh. The name is intended to suggest the original without infringing on any trademarks. This is an uncial (single case) font in which the letterforms favor the capital versions (except d, h, i, k, p, q, y). It has a calligraphic feel, vaguely Hebrew in the squareness of the forms and the weight of the horizontal strokes. Font includes letters & numbers as shown.